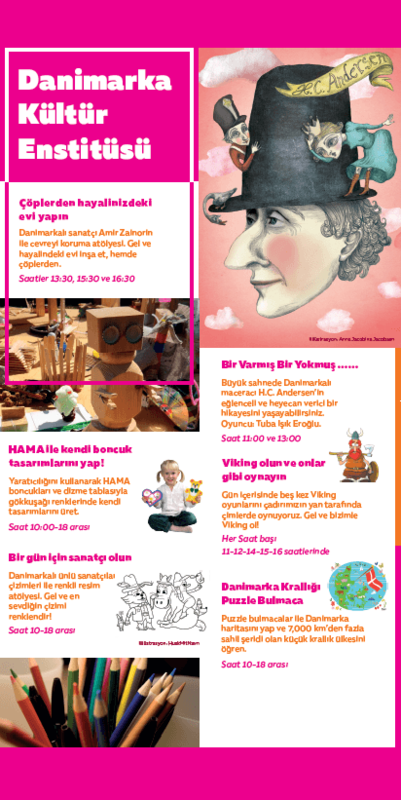 Saturday, September 22nd, Danish Cultural Institute co-arranges and co-hosts a colorful festival in Istanbul, with Danish children’s culture and way of life as its main theme. Children’s Festival Istanbul is a Danish one day festival aimed at children between the ages of 6-12, packed with entertaining, educational and cultural activities. -årige børn med et væld af underholdende, lærerige og kulturelle aktiviteter. The festival is realized through a partnership between the Royal Danish Consulate General in Istanbul, DCI, Novo Nordisk, LEGO, Bestseller, Chr. Hansen, and several Turkish and international NGO’s and charities. The attendants are invited by the partners, and participates free of charge. Children’s Festival Istanbul takes place on a large stretch of grass, owned by the well renowned Boğaziçi University. The project is 100% nonprofit and many of the invited children and their families comes from low-income areas and from orphanages. In the planning of the project the Sustainable Development Goals of the UN has been taking into consideration, particularly those concerning climate, health and well-being, education, and sustainable cities and communities. Approximately 12-2600 children are expected to attend the festival, along with their parents. DCI has been wanting to open a cultural institute in Turkey for some years. A presence in Turkey, and in Istanbul specifically, is important because the country is placed right in the middle of east, west, north and south, and between the Middle East and Europe. In 2018, DCI has started a strategic and focused effort to build stronger bridges between the Danish and Turkish scenes for art and culture, through pop-up events such as the festival for children’s culture, and through short term and long term cultural exchange programs. This April, DCI helped making it happen that Danish actor Elliot Hove, who plays the main part in the award-winning Danish movie Vinterbrødre (Winter Brothers) (2017), attended the 37th version of the Istanbul Film Festival (IFF 2018). He introduced the movie at screenings and took part in Q&A-sessions with the audience. Looking forward, DCI supports a visit by the Danish Teater Minsk (Theater Minsk) at ATTA, an internationally recognized Turkish theater festival for children and adults. This visit is intended to facilitate professional exchange, network building and research – it will also include on-site workshops for Turkish acting students. The visit is part of a long term cultural exchange program, which, among other activities, will also bring representatives of ATTA to Copenhagen, in 2019, where they will visit Teater Minsk, ZeBu, DCI and Springfestivalen. DCI will welcome the attendants of the festival in and around a large tent. Here, a wide range of activities will take place, such as cultural and educational games and workshops – all activities will be connected to a Danish partner or have a Danish component. One of the main activities in the DCI tent, is a workshop about sustainability, facilitated by Danish-Malaysian artist Amir Zainorin. With the inevitable ouput of garbage that the festival will produce, Amir will lead workshops that allows the children to build their dream houses, while they learn about recycling and sustainability. 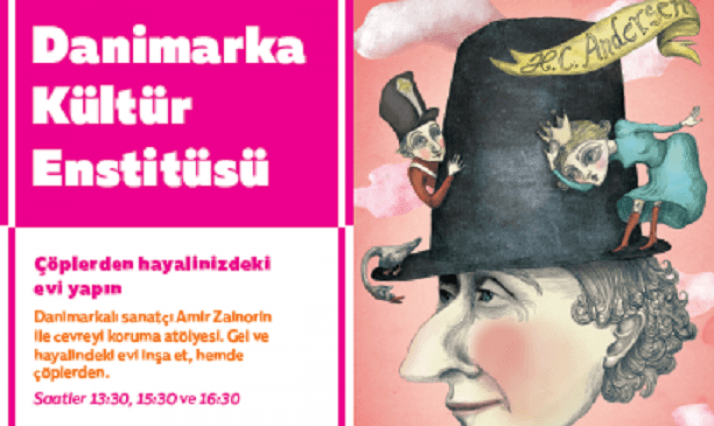 At the main stage of the festival, there will be dramatized readings of Svinedrengen (The Swineherd) and other fairy tales by H. C. Andersen, translated into Turkish. The readings is performed by Turkish actor Tuba Işık Eroğlu. At permanent workshops, the children can play with the colorful Hama-pearls, put together jigsaw puzzles picturing maps of Denmark, and colorize pencil sketches by contemporary Danish artists like HuskMitNavn, Michael Kvium and Julie Nord. There will also be a chance to play with the so-called “vikingespil” (Viking games), which is a mainstay of Danish public life, whether it is at music festivals, garden parties, camping sites, or whereever else people get together to have a nice time out in the open. The festival is arranged in cooperation with the Royal Danish Consulate General in Istanbul, supported by IKP (International Panel for Culture), Novo Nordisk, LEGO, Bestseller and Chr. Hansen. Danish Cultural Institute has also received sponsored workshop-materials and -ressources from Danish companies Hama A/S, Magni A/S and Tactic Games Denmark.